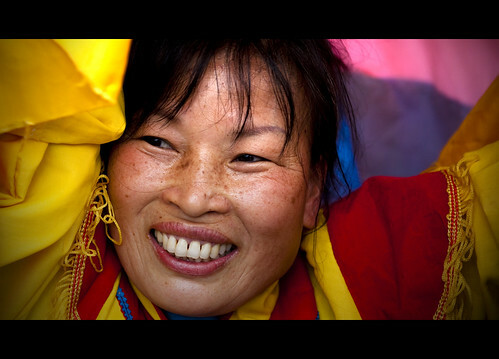 The Chinese lion dance has a long and colorful history, with some saying it originated more than 2,000 years ago in India. 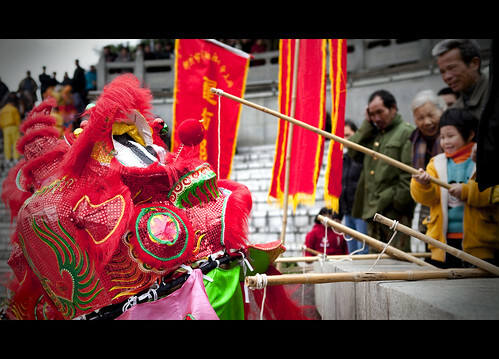 The lion dance is most commonly seen during festivals, such as this month’s Chinese New Year. I’ve witnessed the dances at weddings and business openings as well. The lion dance is yet another way to ward off evil spirits. It was believed that by imitating the characteristics of the lion, the dancers could chase away the evil spirits and usher in luck, prosperity and happiness. In the south, it is common these days to “feed” the lion with an offering of small amounts of cash. These stipends help offset the cost of costumes and other expenses the troupes might incur. Below, happy grandparents look on as a young girl uses a supplied bamboo pole to entice the dragon to come over and take her 1 kwai offering. The lion dance is sometimes confused with the dragon dance. Frankly, until this year I never really noticed the difference. The lion dance is performed by just two people, one each at the head and tail. A typical dragon dance might have as many as 12 performers snaking back and forth as the dragon moves through the streets. Here, one of the performers lifts the lion head mask and reveals herself to the crowd. Everyone was in good sprits during this show in Riverside Park. I wrote last week about the locals needing to make sure they get their fireworks early before supplies run out. They needn’t have worried this year. I’m not sure if sales are off or if they are just better prepared with stock. With the amount of noise I’m hearing EVERY night, I’ll go with the later. As of this morning, there were still plenty of explosive incendiary devices to be found. Joy. These are not like your firecrackers back home. First off, they are deafening. Also, there isn’t any of that mamby-pamby, throw one firecracker at a time nonsense. The huge roll will go off in one fell swoop, with the resulting explosions often lasting for a couple of minutes. These shots were all taken earlier in the week during a photo walk with Jeremy Breningstall. You can check out some of Jeremy’s work on his blog here. One more week until the next term begins. That seems like it went way to fast. I’ve been playing around way to much and now need to return to reality. Another sign that I may be getting old… either the little dog just ate my grilled cheese sandwich or I ate it and totally don’t remember. The dog ain’t talkin’. Cool stuff, Michael. No dances here, just bone-numbing cold. I miss the classroom most days. I don’t miss the pay. You (and the dog) might like grilled cheese with slice or two of SPAM added. Cold here too Steve… mind-numbing, which is a solid excuse for me. I bet it has been 30 years or more since I had any SPAM, the edible kind anyway. 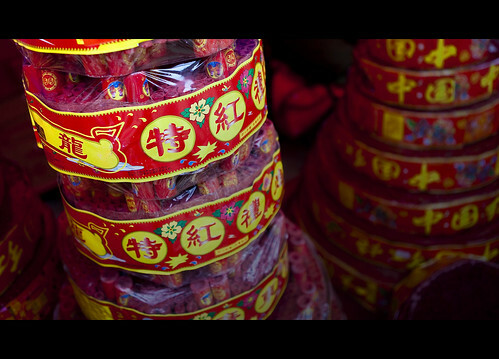 Now there is something I don’t miss, the deafening sound of Chinese firecrackers. Even though they are illegal in the Netherlands, they seem to find their way into the country around New Year. Heard one that lasted up to 15 minutes, ugh.